09. Last Night Was Really Fun? In 2008 NOFX starred in the TV show BACKSTAGE PASSPORT, a series that documented the insane hijinks of the band as they weaved an unsteady path through exotic locales where most sane bands fear to tread. The reality romp originally aired on FUSE and later went on to be released on DVD, which served up tons of ''too hot for TV'' bonus footage. 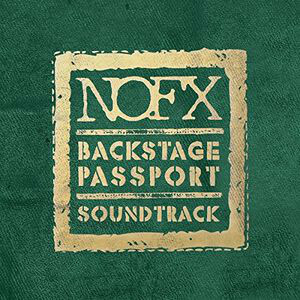 After the resounding success of the series, NOFX have been met with endless requests for a soundtrack including all the rare and exclusive songs (5 previously unreleased) from the show. After all, NOFX were beloved for their music long before their foray into the world of the Kardashians, Real Housewives, and the like. Well, fans can finally stop their pleading, because the official BACKSTAGE PASSPORT SOUNDTRACK is finally going to be available on CD and LP. Packed with 15 tracks from both seasons (That's right! The second season is nearing completion as you read this. ), the BACKSTAGE PASSPORT SOUNDTRACK is a one-stop shop for all the rare, remixed, and unreleased material that fans could only previously enjoy as snippets during the show. Followers of the show and diehard NOFX collectors will both be ecstatic that this soundtrack has gone from rumor to reality.